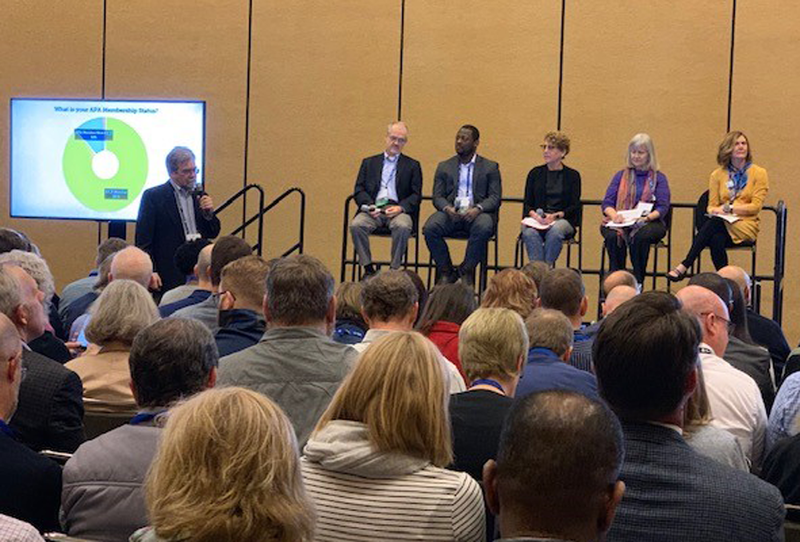 What's Happened on Sunday at #NPC19? 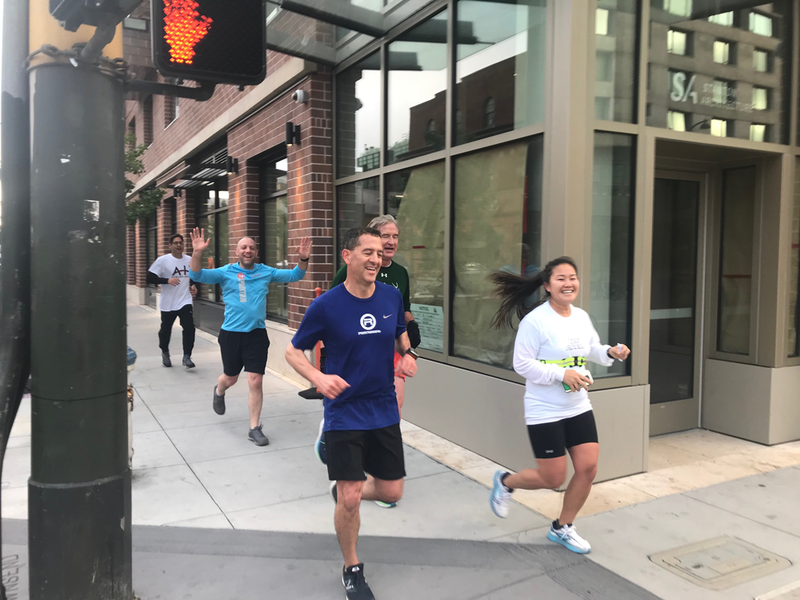 On Sunday in San Francisco, planners started early with a 5k run and powered through a full day of learning, networking, connecting, and sharing. Some top topics: planning's important role in social issues ranging from gentrification to human trafficking. Scroll through to catch up on what you may have missed. Check out Saturday, Monday, and Tuesday happenings, too. The newly adopted Equity in Planning Policy Guide sets the policy for APA as an organization and for APA members. According to the policy guide work group cochair Susan Wood, AICP, the guide will be used to move the equity needle forward. Equity is not an extra for planners, it is in fact a hard skill. Marcella Bondie Keenan, a member of the Social Equity Task Force member, discussed the five-point agenda from the task force’s report and the 25 recommendations it presented to the APA Board this past week. Libby Tyler, FAICP, vice chair of the Diversity Committee, shared the ongoing work of the committee to raise the visibility of equity, diversity, and inclusion throughout APA. She remarked that equity, diversity, and inclusion is a focus of NPC19. Tyler explained the five strategies that are the foundation of the diversity and inclusion strategy, vision and mission. The remainder of the Plan4Equity Forum was spent, in the words of moderator Miguel Vazquez, AICP, activating the planners. Round table discussions focused on each one of the five strategies outlined in the Diversity and Inclusion Strategy. Participants moved from table to table, discussing the opportunities and challenges they saw to advance equity, diversity, and inclusion within their own work, in APA, and the profession. At the end of the forum, each table moderator reported back the conversations that took place and shared their “a-ha” moment. One such moment was the discussion about determining metrics to gauge success of equity and inclusiveness specifically. “It’s not really about placemaking. It’s about place keeping,” Julia Sabory told a packed room on Sunday evening. She was talking about the 2018 formalization of San Francisco’s cultural district program, which she manages from the Mayor’s Office of Housing and Community Development. Session speakers Brian Cheu, Mayor’s Office of Housing and Community Development; Diana Ponce De Leon, Office of Economic and Workforce Development; Honey Mahogany, co-founder of Compton’s Transgender Cultural District; Carolina Morales, District 9 Supervisor; Raquel Redondiez, director of SOMA Pilipinas Cultural District; Rich Sucre, principal planner for the city of San Francisco; Erick Arguello, president of Call 24 Latino Cultural District; Julia Sabory, the cultural district program director of San Francisco. Photo by Lindsay Nieman. Through the program, the city is working to stabilize neighborhoods losing their identity due to gentrification and displacement. It’s a powerful, community-driven tool fully supported by the planning department and city — including financially. San Francisco is diverting a significant portion of its hotel tax, which funnels about $3 million a year into local arts and culture, to placemaking efforts, legacy businesses, events, housing, and community services in the districts. The session focused on three of the first officially recognized neighborhoods—the Mission’s Calle 24 Latino Cultural District, SOMA Pilipinas Cultural District, and Compton’s Transgender Cultural District—with representatives from each on hand to discuss the strategies being deployed on the ground. For Compton’s, maintaining the Tenderloin as a safe place for transgender and gender nonconforming people is the priority. The second day of the conference came to an end with a deep dive session on equity and health. It brought together professionals from planning and public health fields — a cross-sector collaboration in a true sense. The session was divided into three sections. Each started with a group of presentations followed by interactive exercise(s). In the first section, Tina Yuen from the ChangeLab Solutions described how planning decisions and policies such as urban renewal, highway construction, redlining, and mortgage lending practices have shaped neighborhood conditions and social/health inequities. That discussion provided a solid reason as to why considering and incorporating equity and health in planning is important. The second part focused on Health in All Policies (HiAP) approach, specifically an explantion of what the approach is and how it can be applied to planning. Lianne Dillon from the California HiAP Taskforce and Karen Nikolai from Hennepin County, Minnesota, led this part of the session. Dillon reviewed the HiAP approach and how it can be applied to incorporate equity in planning processes. Nikolai shared her county’s experiences and engaged the audience members in an interactive exercise, providing a hypothetical situation and asking the small groups to discuss specific ways to initiate community engagement efforts. The third section was related to planning practice and explored the ways planners can integrate health and equity into their work. I talked about a project in which APA’s Planning and Community Health Center is providing technical assistance to three communities to help them integrate health and equity into their comprehensive plans. The center is working on this project in collaboration with the Health Impact Project. Project leads from the three communities each shared an aspect of their comprehensive plan process related to health and equity. Ashley Hefner from Culver City, California, talked about equitable public participation in comprehensive plans. Meaghan Overton from Fort Collins, Colorado, discussed the use of data and metrics to create health equity spatial index in her community. Rebecca Stonefield from Pinellas County, Florida, talked about their cross-sector collaboration efforts to advance health equity. At Sunday’s session on broadband, speakers posed one important question to the audience: How do we practice digital inclusion? The panel, which featured representatives from a mix of private, public, and civic organizations, pointed to affordability and access to high-speed, reliable internet as two of the biggest challenges facing planners and their communities today. The solutions to these challenges lie in creative interventions, partnerships with local tech companies, and understanding what federal programs can be leveraged to make it easier for communities to tap into broadband. How do we create a system that both developers and communities can get behind? With fewer millennials getting licenses and more demand for vibrant, pedestrian communities, this is an issue many cities and municipalities are trying to address. NPC19 hosted a lively debate about parking maximums and other parking-related issues with real estate consultant Malek Abdulsamad of Compass Commercial, banking professional Ranadip Bose, AICP, of SB Friedman, active transportation planner Lindsay Bayley of Chicago Metropolitan Agency for Planning, and advocacy group leader Anthony Jordan of Portlanders for Parking Reform. Jane Wilberding, AICP, of Sam Schwartz Consulting was the moderator. Speakers represented different viewpoints on parking minimums and maximums. Photo by Molly Walsh. Abdulsamad and Bose encouraged planners to think about parking from the developer side and how parking works into the economics of the projects being built in their communities. Bayley and Jordan represented the interests of planning with less parking. Bose talked about the benefits of mixed-use projects and advocated for addressing parking within the context of the area, as opposed to a one-size-fits-all solution. Abdulsamad called attention to the need to address not only parking needs for residents but also visitors. He cited Chicago’s Loop area, where the desire for residential parking has decreased but the need for visitor parking has increased with commercial development. For Bayley, the problem of parking cannot be solved by building more parking. She explained the problem as cyclical: If commute times are long and parking spaces limited, a municipality may try to solve the issue by adding lanes and parking. Both give people an incentive to drive, and the problem begins all over again. Jordan said many communities feel that they cannot implement bold changes and policies because they are too radical and they “aren’t Portland or New York City.” He made the argument that Portland was not always “Portland” and they are known as a leader in the area because of bold regulation changes made in the ‘70s. He encouraged attendees to not wait for “good transit” to discourage new parking supply. He indicated that ample parking will guarantee that you will not have good transit to that site in the future and to plan for where you want to be. Although the debaters differed on many points, all present agreed that parking minimums are a potential problem for solving the parking issues facing communities around the country. Delegates representing all 47 APA chapters and their members made history today when they adopted APA’s first policy guide on Equity, along with two other guides on housing and surface transportation. 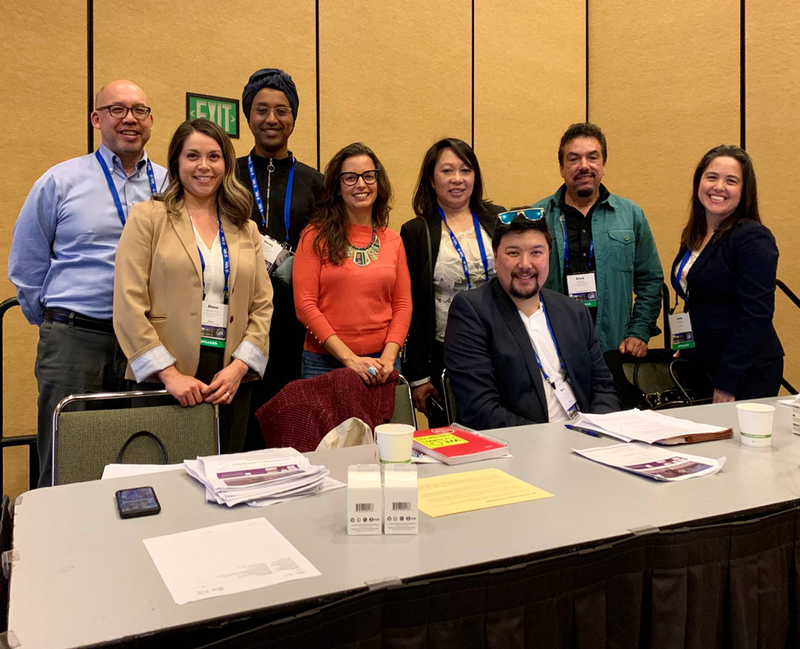 The NPC19 Delegate Assembly marks an important milestone in the APA policy development process in which members play a leading role. More than 100 members gathered for a lively discussion in which they debated and amended final changes to the three guides up for consideration. The guides will next go before APA’s Board of Directors for final approval. Policy guides represent APA’s official policy positions on timely issues and informs how APA engages on advocacy related to a specific issue. "A year’s worth of work to build the highest compliance rate in the country disappeared overnight." 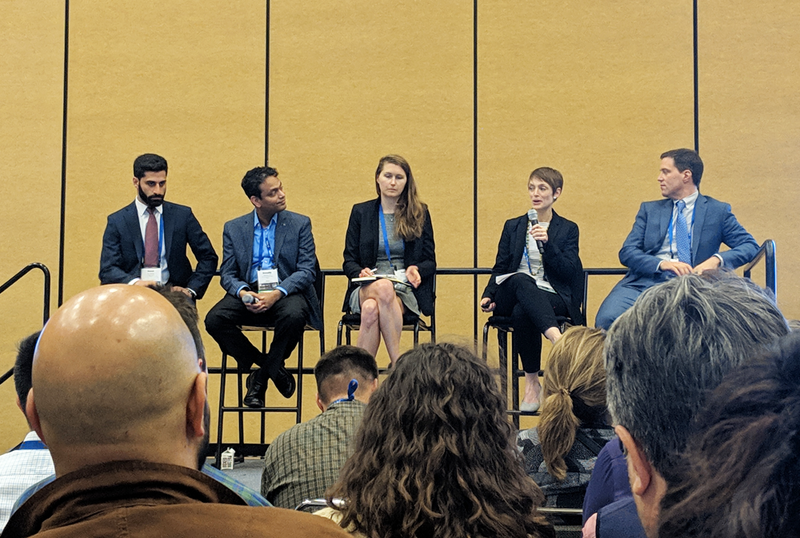 In the second of three NPC19 sessions on the topic of short-term rentals (STRs), panelists on Sunday discussed a critical but challenging component of regulating STRs — compliance. Since the advent of STR advertising platforms many cities have passed ordinances to regulate short term rentals, but as moderator Ulrik Binzer explained, few have seen levels of compliance needed to achieve desired impacts of maintaining sufficient housing supply and reducing nuisance complaints from neighbors. Cities have few cost-effective means of identifying owners who are skirting ordinances. According to panelist Jeffrey Goodman, the City of New Orleans attempted to work with two of the largest platforms to increase compliance, but found that “working with the platforms is challenging at best.” After the city began discussing additional changes to its STR ordinance, the largest platform pulled its permit data from the listings overnight. Binzer, Goodman, Elizabeth Caraker, AICP, from the City of Monterey, California, and Daniel Mick from the City of West Hollywood, California, discussed how big data and compliance software now provide cities with usable address and owner data that allows communities to focus on enforcing short-term rental regulations. Myth or truth: Human trafficking only occurs overseas? Answer: Myth. As a matter of fact, in 2017, there were 101 cases of human trafficking reported Arizona, 1,305 in California, and 110 in Colorado, according to anti-trafficking organization Polaris. Our interpretations of trafficking may be a little outdated. 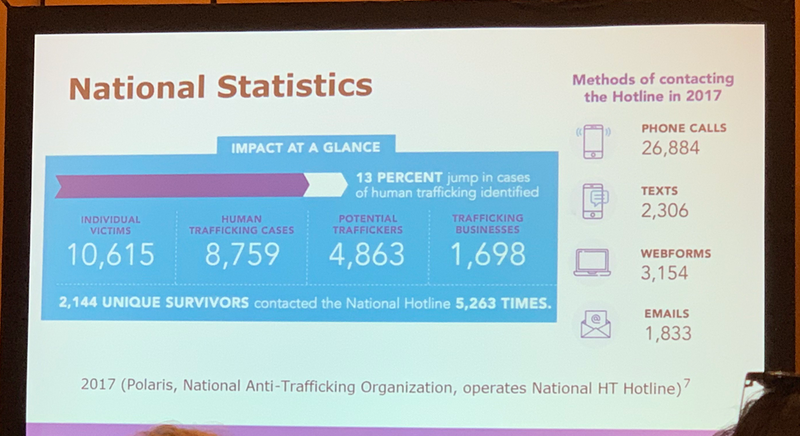 National statistics on human trafficking. Photo by Ariana Hampton-Marcell. Edson Ibañez, city planner associate for the City and County of Denver, and Manuel Muñoz, senior planner for the City of Azusa, California, presented a case study about Azusa’s efforts to curb the incidence of human trafficking by implementing land-use policy as a proactive/preventative method. In this case, Azusa succeeded in placing a moratorium on all Massage Parlor Business licenses which led to reassessing permit codes and creating a “Massage Parlor Toolkit” that better formalizes the process for approving business licenses. The toolkit consists of a five-step checklist for planners to refer to prior to approving permits: Ordinance – Legal Standing, Massage Parlor Permit, Conditions of Approval, Checklist & Procedures, and Resources – Non-Profits. 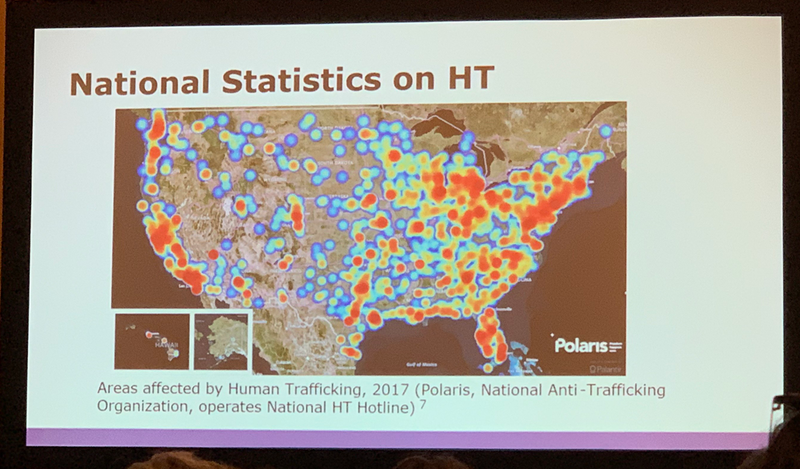 A map of the areas affected by human trafficking in the U.S. Photo by Ariana Hampton-Marcell. Additional recommendations for planners include being proactive about seeking information and training sessions that help to recognize red flags in their own cities and to join the conversation with law and code enforcement for more direct impact. Heads up, phones out, ethics on. During this morning’s popular and interactive session, attendees unpacked six true scenarios from all over the country that have been brought before AICP Ethics Officer Jim Peters, FAICP, who also moderated the session. Before diving in, Peters revealed 10 categories of the most common ethics complaints he has reviewed in the past year, with Honest and Fair Dealing, Conflicts of Interest, and False/Deceptive Statements leading the list. The panel of five AICP Ethics Committee members presented cases that were followed by a series of poll questions for the audience, questions about whether the existing principles within the Code of Ethics and Professional Conduct are sufficient enough to address and resolve each particular case. Attendees used their phones to submit their responses, which were recorded and projected immediately on the screens for further discussion. Results of attendee voting appeared on screens during the Ethics Case of the Year session. Photo by Ariana Hampton-Marcell. One attendee managed to sum up the plight of planners — “We don’t want to be the hero of the story, but we always want to do the right thing” — while another cautioned planners to “remember that we’re administering ethics, not law” and to think carefully about their roles. In this session on Sunday, Chris Schildt from PolicyLink shared a progressive “right to return” policy from Portland, Oregon, that seeks to actively address wrongs inflicted on past generations. The N/NE Preference Policy states that in designated areas once cleared by urban renewal, preference for new affordable housing units in those neighborhoods is given to descendants of those whose parents or grandparents were affected by that urban renewal. Water is a part of a very complex, integrated system with land use. How the land is used determines how the water is needed yet land-use and water planning typically happen in silos. Water and land are both limited resources and as demand grows for water, it becomes more expensive, causing a ripple effect through the community, including the cost of housing. A Sunday session explored how to break down these silos and build a framework for integrating water and land-use planning in communities. Jeremy Stapleton, LEED, Director of Climate Resilience at Sonoran Institute, overviewed the many ways planners and other officials can collaborate to address water needs in their communities. Planners can use land-use tactics like smaller lot single-family development, multifamily developments, and landscaping and irrigation restrictions to help address stress on the system. Although it is sometimes a challenge to get the right people together to address these needs, Jim Holloway, executive director for the Babbitt Center for Land and Water Policy, stressed the importance to take a step back and think about the water needs and uses for the larger region around your community to ensure the uses add up to the regional supply. Session attendees were able to hear about some of these practices put into action from Andrew Spurgin, AICP, principal planner for the City of Westminster Community Development, whose community has worked to manage both growth and water. 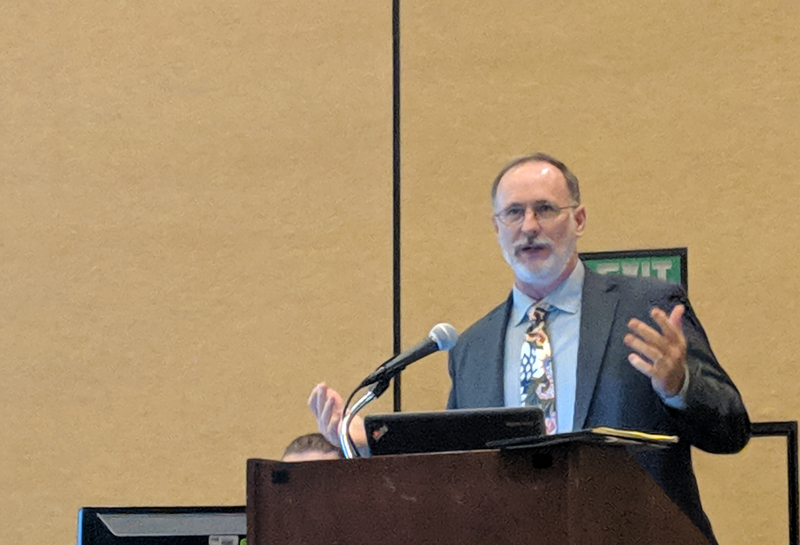 Jim Holloway, executive director for the Babbitt Center for Land and Water Policy, offers an overview of integrating water into comprehensive plans and land use into water utility plans. Photo by Molly Walsh. NPC19 got runners and walkers up and going at 6:30 a.m. on Sunday for a course that ran along city streets by the Bay. APA's event partner was Sports Basement, a local San Francisco retailer that specializes in fitness activities. Participants were happy for a relatively flat course for the 5K Run and Walk at NPC19. Photo by Meghan Stromberg. Top image: The NPC19 Data Jam — an intensive workshop where volunteers explore problems using open data, technology, and design — focused on data-driven transit planning. Photo by Randall West.